Cloud watching is contagious--just look at a few of the photos friends, family, and acquaintances are sending me in the wake of the the publication of my book, A Sideways Look at Clouds. It's heartwarming to know more people are taking the time to look up at the skies (and ceilings). Thank you for sharing your photos with me. These stratocumulus beauties--the silver lining of an unsuccessful duck-hunting trip--were captured over Davis, North Carolina. Photo by Matthew Mudd. From a friend visiting Boston this week, I received these heavenly cumulus clouds from the ceiling of the Isabella Stewart Gardener Museum. So many paintings use clouds to where gods, goddesses, and cupids cavort. This is the "Coronation of Hebe" by 16th-century painter Paolo Veronese. Hebe is the Greek goddess of youth and cupbearer to the gods of Mt. Olympus. Nice work if you can get it! Photo by Anne Kilgannon. Here is a detail of the "Coronation of Hebe" painted long before we knew clouds could not support the weight of one (not to mention five) bodies for a cozy celebration. And here, a cirrus fibratus cloud from Vashon Island, WA. It's incredible what forms ice takes in our atmosphere. Photo by Richard Rogers, who named this cloud an "Angel Feather" and has written a book called 100 Words for Rain. Watch a fun video here to learn some of these PNW insider names. Thanks to Emma Amiad of Vashon Island for this photo (and 26 more! ), taken near Yakima, WA. When you have a big unobstructed view of the horizon and a flotilla of cumulus humilis and cumulus fractus clouds, it's time for some mind bending. The clouds on the horizon are not lower that the clouds at the top of the photograph. All the gray bases of these clouds are at the same altitude. Yessiree. Each of these clouds formed from rising moist, warm air, which contains invisible water vapor. When that air reaches a certain altitude/temperature, the water vapor cools and condenses into visible water droplets--our cloud. That altitude is known as the "condensation level." Emma Amiad also sent in this photo of low stratocumulus clouds over Wyoming's Teton Range. Aren't the three window-like holes in the cloud layer striking? Funny how the lack of cloud is what makes this photo so dynamic. Thank you Matt, Anne, Richard, and Emma. Join me this Thursday, September 21, for a live Mountaineers Books webinar. I'll be talking about my new book, A Sideways Look at Clouds, providing you some tips on how to talk about clouds, sharing some photos of spectacular clouds, and answering your most pressing cloud questions. All you need is a computer to register here and to watch the webinar from the comfort of your own home, office, bucket seat. The webinar starts at 7 p.m. (PDT). Perfect timing for dinner with the clouds if you're on the west coast. On the East Coast? How about a Cloudy Happy Hour at 4 p.m.? Busy Thursday? Use this link to request a link to the recorded webinar for viewing later. This webinar is co-sponsored by Black Hills Audubon Society (my local chapter in Olympia, WA). Don't have an hour? Check out this video trailer for A Sideways Look at Clouds. Don't have a minute? 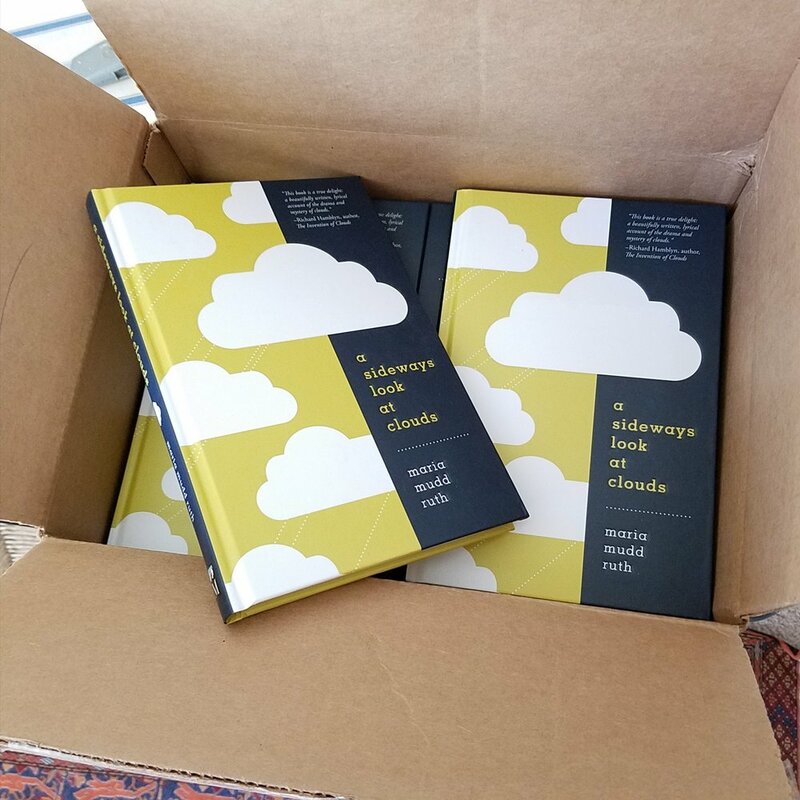 Order your copy of A Sideways Look at Clouds directly from Mountaineers Books. Books are also available on Amazon (Kindle and print) Powell's, Barnes and Noble and your favorite indie bookseller. If you'd like a signed/inscribed copy shipped to you, contact Browsers Bookshop in Olympia. Ready for 1'22" of Cloud Fun? Do judge a book by it's cover! And then take a peek at the book trailer Mountaineers Books just released on YouTube. Wooohooo! Order yourself a copy and look up while you wait for delivery! Check out my events page for upcoming talks/book signings in Washington D.C. and the Bellingham-Seattle-Olympia corridor!